We’ve been talking about map projections a lot recently. This isn’t a new experience for us, of course. Making Story Map and What I Heard About the World, we were lucky enough to work with the team at Worldmapper who increased our understanding of what map projections are and mean: the ‘projection’ is the way the shapes of the countries on a 3D globe are translated on to a 2D map. This inevitably involves distortion of shapes and/or sizes of the landmasses and countries. The projection we (in the UK) are most familiar with is the Mercator projection. It’s what most of us encounter in school, and it is still what Google Maps use. They key thing to know about the Mercator projection is that it is a navigator’s map, so if you draw a straight line anywhere across it, the compass bearing on that line is always the same. 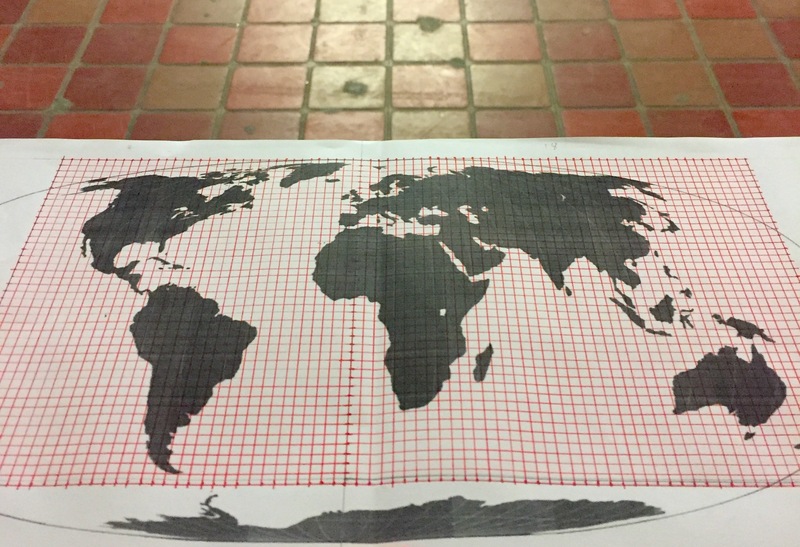 But to achieve this some distortion is required, and the closer to the poles it gets, the more the surface area of the globe is stretched out to fill the width of the map. So the size of the countries near the poles is exaggerated, relatively, to the countries close to the equator. (We talk about this in our short film, Popcorn, too). The most infamous example of this, of course, is that on the Mercator, Greenland looks as big as Africa. Take a look, here. When in fact, on the globe, Africa is fourteen times larger than Greenland. There are actually many different map projections available, that attempt different solutions to the 3D sphere – 2D map problem. The Map Projections website provides a great catalogue of them. This week (tomorrow and Monday in fact!) we are restaging The Journeys, our collaboration with our good friends at SBC Theatre, for the Caravan Showcase as part of Brighton Festival. Billed as a durational performance installation, it’s a simple story telling performance, in which we trace numerous human migrations across a giant map, and tell the stories of the people – individuals and groups – who made those journeys. Some are from our own research, others have been told to us by friends, acquaintances and visitors to the performance last year. 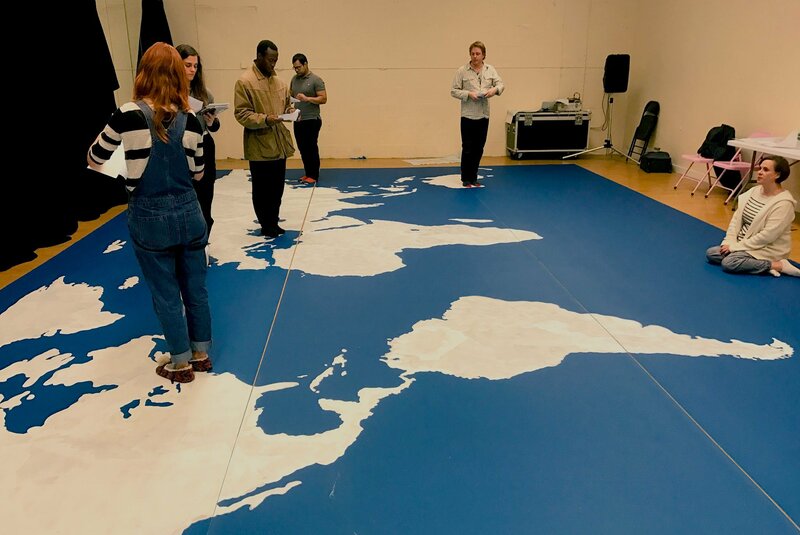 We made the show for Sheffield’s Migration Matters Festival last summer, drawing the map directly onto the tiled floor of Theatre Delicatessen in their last week in the old Woolworths. We talked about the importance of the map projection to the show. We felt it was important that we use a true-area map projection, so that no country or continent was given undue visual prominence. But we also wanted to present the audience with a map that they recognised, that didn’t seem distractingly distorted. We opted for the Tobler Hyperelliptical projection, which makes its own distortion visible by being oval. We then gridded up and drew this projection onto the tiled floor grid of Theatre Deli. But a problem with the Tobler, for our purposes, was that at the extremes of the map (which is euro- and afro-centric), the shapes of some islands become almost unrecognisable – notably Japan and New Zealand. So we ended up cheating these slightly so they were more easily recognisable for the audience (and the performers!). Now we’re making a touring version of the show, with a “portable” map. This time we’ve opted for a compromise projection. I went back to Benjamin Hennig at Worldmapper and asked his advice. He suggested we look at a Gall Stereographic Projection. This seemed to work well for our purposes – it looks quite ‘real’ and is not too extreme in its distortions. The northernmost parts are a bit bigger in size than they really are, but given that we currently have more stories involving travels to or from Europe, that is actually helpful to the task of the performance. James Gall’s projection (made in 1855) was used as the basis of a new projection by Arno Peters in the 1970s, to create the most famous true-size projection – most famous because it was featured in a 2001 episode ofThe West Wing. Peters’ Projection is now more commonly, and correctly, referred to as the Gall-Peters Projection. [See Simon Garfield’s brilliant On The Map (Profile Books 2012) for more about all this]. Of course, the projection is only the basis of our map. It is translated through a process of making a high contrast, 2 colour image; cutting that image up into overlapping sections; projecting those images straight down onto the floor (huge thanks to Rob Hemus at University of Sheffield for his help with this); moving the rolls of floor through that projected image and changing the images when necessary to jigsaw them together and hand painting the outline onto the floor (thank you Ellie Whittaker and Samantha-Jane Turner). Because to understand a map, and its distortions, you need to remember what the map was designed for. And ours is designed for making journeys visible, moving across and telling stories on. We’ll be laying out our map in its first temporary home, the Brighton Unitarian Church this Sunday, and telling and collecting stories of migration (3.30–5pm on Sunday 13th, 10.30am – 5pm on Monday 14th). If you’re going to be in Brighton, please do drop in and see us. Special thanks to Caravan, the British Council, Farnham Maltings, Theatre Delicatessen and LARC/Leeds Beckett University for supporting this restaging.